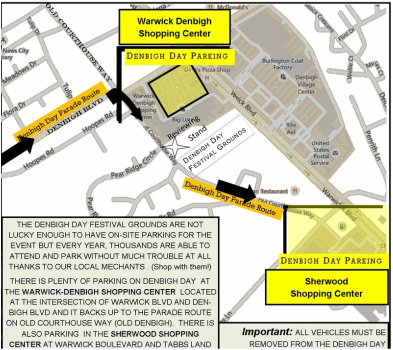 The Denbigh Lions Club invites you and all of Newport News out to the Denbigh Day Festival! It has always involved the local business community who have energetically supported the effort from its start - those merchants know that Denbigh Day will bring out the true "Denbighites." And they come out in large part because they want that sense of "community" that is diminished in modern times. The Denbigh Day effort involves a lot of effort - your help is needed - become a sponsor of the Denbigh Day Festival - volunteer your efforts to the community -purchase a vendor booth. OR - you may use the online submission function below. Please review the application thoroughly. Proceeds from Denbigh Day vendor spaces go to local sight and hearing initiatives for adults and children. Ask a Denbigh Lion for more details or check out Lions International to see how Lions Serve the community all over the world. The Denbigh Lions Club announces that this years Denbigh Day event will follow the successful theme of an Arts and Crafts Festival. Denbigh Day will be held on Saturday, September 21, 2019 from 9:00 am until 4:00 pm on the grounds of the Courthouse Way Community Center at 14302 Old Courthouse Way in Newport News. NO RAIN DATE IS PLANNED. Attractions are planned for all in the form of a parade, arts and crafts exhibits, rides for the young people, live musical entertainment, games, educational displays and the ever popular local gourmet delights. As sponsors of Denbigh Day, the Denbigh Lions Club invites you to participate in the festivities. As in years past, this event will be an excellent opportunity to display your talents, skills, or the attributes of your group and to raise money for your needs. 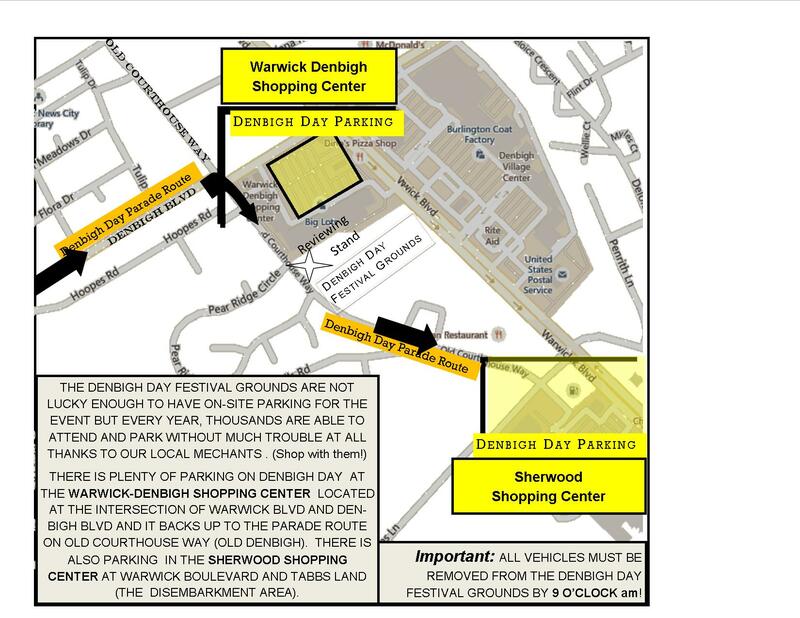 ​To every extent possible, we encourage you or your organization to participate in Denbigh Day. Please submit your application as quickly as possible because space will be assigned on a “first come-first served” basis. No commissions will be charged by the Denbigh Lions for any sale; however, each exhibitor will be responsible for collecting the Virginia sales tax, if required. Exhibitors must supply whatever is needed in the way of booths, chairs, tables, hanging/display material, and an attractive sign designating the organization, goods, and/or service offered. We also strongly recommend that you provide an overhead cover as protection from the sun. Exhibitors will be responsible for their property, as the Denbigh Lions Club accepts no responsibility for acts of vandalism, theft, or rioting. Exhibitors are expected to clean up their respective area at the end of the day. The attached exhibitor’s application should be completed, signed, and returned with payment no later than Monday, September 16th, 2019. The Denbigh Lions Club plans to sell soft drinks and Brunswick stew. If you have any questions, please contact one of the chairmen below. Please fill out this application as completely as possible. The type of food and/or drink to be sold needs to be specific. On Denbigh Day, NO ONE WILL BE ALLOWED TO SELL FOOD OR DRINK IF NOT REQUESTED ON THIS APPLICATION. The Denbigh Lions Club reserves the right to refuse an application to avoid excessive duplication of products. You are responsible for obtaining any required Newport News City Permits. If you plan to sell prepared food, call the health department. Individual flea market permits will not be required since the Denbigh Lions Club will acquire a collective permit. 2. WHAT SIZE AND TYPE OF SPACE DO YOU NEED? (Check size and type required) An online processing fee is added for online checkout only - if payment is mailed, the fee is not applicable. All generators must be approved prior to Denbigh Day! NO RAIN DATE IS PLANNED DUE TO THE SPECIFIC DATES OF OUR PERMITS (PARADE, FLEA MARKET, ETC). IF YOU PLAN TO SELL FOOD, YOU MUST OBTAIN YOUR OWN PERMIT FROM THE NEWPORT NEWS HEALTH DEPARTMENT. NO LIQUID STRING/STRING IN A CAN MAY BE SOLD. Upon submitting your online application, you will be redirected to a confirmation page with a link to pay for your vendor space online - this is provided for your convenience and gives you the capability to use Visa and MasterCard to pay your vendor fees - there is a processing fee of $5 for online purchases only - use of the online checkout is OPTIONAL. You may mail your check as usual to the address on the vendor application.